2250. Townsend, J., Hydrogen partitioning between postperovskite and bridgmanite (invited), CDAC Informal Talk, Geophysical Laboratory, Carnegie Institution of Washington (Washington, DC, February 19, 2016). 2249. Townsend, J., Hydrogen partitioning between postperovskite and bridgmanite (invited), Sandia National Laboratory High Energy Density Physics Seminar (Sandia, NM, March 21, 2016). 2248. Jacobsen, S. D., Earth's deep water cycle: Atomic to geophysical scales (invited), Purdue University Department of Earth, Atmospheric, and Planetary Sciences (West Lafayette, IN, February 19, 2016). 2247. Jacobsen, S. D., Earth's deep water cycle: Atomic to geophysical scales (invited), University of Western Ontario Department of Earth Sciences (London, Ontario, Canada, February 7, 2016). 2246. Miyagi, L., Texture development and Slip systems in lower mantle phases (invited), Université Lille 1 (Lille, France, January, 2016). 2245. Miyagi, L., Deformation and anisotropy in the lowermost mantle: Can we do Structural geology at the core mantle boundary? (invited), Idaho State University (Pocatello, ID, January, 2016). 2244. Miyagi, L., Deformation of ferropericlase at high pressure and temperature: Is there a viscosity jump in the mid-lower mantle? (invited), University of California - Berkeley (Berkeley, CA, March, 2016). 2243. Daviau, K., Inside a diamond planet: Experimental ocnstraints on exoplanet interiors, Brown Unviersity, Department of Earth and Planetary Sciences Colloquium (Providence, RI, March 17, 2016). 2242. Dlott, D. D., Shock compression spectroscopy under a microscope (invited), Air Force Research Laboratory (Dayton, OH, March, 2016). 2241. Shaw, D. M., Laser driven flyer plates for studying shock wave energy dissipation, Los Alamos National Laboratory (Los Alamos, NM, January 2016). 2239. Fultz, B., The origin of entropy in materials (keynote), William Hume-Rothery Award Symposium, TMS Annual Meeting (Nashville, TN, February 14-18, 2016). 2238. Herriman, J., L. Mauger, O. Hellman, S. J. Tracy, M. S. Lucas, J. Muñoz, J. Horwath, J. Li, and B. Fultz, Reduced elastic anisotropy at moderate temperatures from nonharmonic effects, William Hume-Rothery Award Symposium, TMS Annual Meeting (Nashville, TN, February 14-18, 2016). 2237. Yang, F., J. Muñoz, O. Hellman, M. S. Lucas, and B. Fultz, Phonon-induced charge transfer and electron-phonon interaction in FeTi, William Hume-Rothery Award Symposium, TMS Annual Meeting (Nashville, TN, February 14-18, 2016). 2236. Zurek, E., Chemistry under pressure (invited), Queens University (Kingston, Ontario, Canada, March, 2016). 2235. Bassett, W., 32-channel emission spectrometer for studies of energetic materials, Stewardship Science Academic Programs Symposium (North Bethesda, MD, February 17-18, 2016). 2234. Daviau, K., Inside a diamond planet: Dissociation of SiC at high P-T, Stewardship Science Academic Programs Symposium (North Bethesda, MD, February 17-18, 2016). 2233. Duwal, S., Isostructural transition and metallization in WS2, Stewardship Science Academic Programs Symposium (North Bethesda, MD, February 17-18, 2016). 2232. Hu, Y., Five-coordinated silicon in diopside at high pressure by single-crystal x-ray diffraction and first principles calculations, Stewardship Science Academic Programs Symposium (North Bethesda, MD, February 17-18, 2016). 2231. Li, M. L., Thermal conductivity of anisotropic materials at high pressure, Stewardship Science Academic Programs Symposium (North Bethesda, MD, February 17-18, 2016). 2230. Lin, F., Elastic visco-plastic self-consistent analysis of periclase deformation, Stewardship Science Academic Programs Symposium (North Bethesda, MD, February 17-18, 2016). 2229. McGuire, C., High pressure and temperature equation of state for Fe5Si3, Stewardship Science Academic Programs Symposium (North Bethesda, MD, February 17-18, 2016). 2228. Moore, S., Fabrication of designer diamond anvils using maskless lithography with integrated wireless data transmission, Stewardship Science Academic Programs Symposium (North Bethesda, MD, February 17-18, 2016). 2227. Palomares, R., Controlling the stability of octahedral GeO2 glass using in situ ion irradiation at high pressure, Stewardship Science Academic Programs Symposium (North Bethesda, MD, February 17-18, 2016). 2226. Shamp, A., Theoretical studies of the primary Hugoniot and solid state properties of boron carbide in extreme conditions, Stewardship Science Academic Programs Symposium (North Bethesda, MD, February 17-18, 2016). 2225. Shaw, W., Shock wave energy dissipation of nanoporous materials, Stewardship Science Academic Programs Symposium (North Bethesda, MD, February 17-18, 2016). 2224. Shelton, H., Evolution of interatomic and intermolecular interactions of melamine at high pressure, Stewardship Science Academic Programs Symposium (North Bethesda, MD, February 17-18, 2016). 2223. Smith, S., Evolution of interatomic and intermolecular interactions of melamine at high pressure, Stewardship Science Academic Programs Symposium (North Bethesda, MD, February 17-18, 2016). 2222. Song, J., Magnetic ordering at anomalously high temperatures in Nd and Dy under extreme pressure, Stewardship Science Academic Programs Symposium (North Bethesda, MD, February 17-18, 2016). 2221. Rodgers, J., Proteins under extreme pressures – A computational study, Stewardship Science Academic Programs Symposium (North Bethesda, MD, February 17-18, 2016). 2220. Townsend, J., First-principles investigation of hydrous post-perovskite, Stewardship Science Academic Programs Symposium (North Bethesda, MD, February 17-18, 2016). 2219. 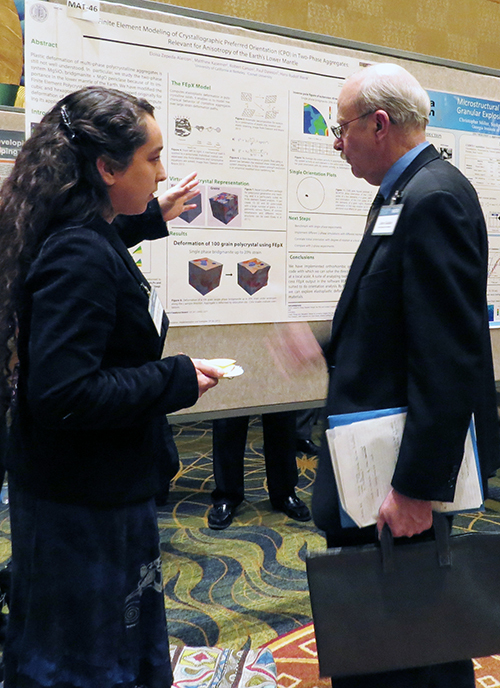 Zepeda-Alarcon, E., Finite element modeling of crystallographic preferred orientation in two phase aggregates relevant to anisotropy in the Earth's lower mantle, Stewardship Science Academic Programs Symposium (North Bethesda, MD, February 17-18, 2016). 2218. Hemley, R. J., Carnegie/DOE Alliance Center: A center of excellence for high pressure science and technology (invited), Stewardship Science Academic Programs Symposium (North Bethesda, MD, February 17-18, 2016).